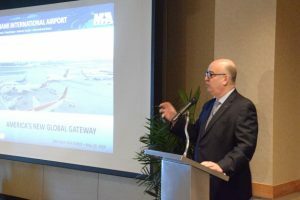 Miami International Airport officials hosted the second meeting of the MIA Asia Task Force on May 10 to review the results of travel surveys from more than 100 local organizations that have strong business ties to the Asian region. The group also discussed next steps in its efforts to secure first-ever nonstop passenger service between Miami and Asia. Representatives from 39 community and business groups joined Miami-Dade Aviation Department (MDAD) Director Emilio T. González and Miami-Dade County Commissioner José “Pepe” Diaz, Chairman of the Board of County Commissioners’ Trade and Tourism Committee, for a follow-up to the task force’s first meeting in November 2015. Among the key findings discovered in the survey results: a majority of the respondents conduct business activity in Asia and travel to Asia regularly; and most of the respondents would use nonstop service to Asia, regardless of the frequent flyer program. The second task force meeting comes on the heels of a successful business development trip by County officials to mainland China and Taiwan in April, when Commissioner Diaz and MDAD Deputy Director Ken Pyatt led talks with three of China’s leading passenger airlines – China Eastern Airlines, China Southern Airlines and Hainan Airlines — regarding the potential for nonstop service to Miami. Additionally, as part of MIA’s ongoing outreach to aviation officials in Asia, MDAD executives hosted representatives from Narita (Tokyo) International Airport on April 28, and will also meet with a delegation of Indonesian aviation officials on May 18. In 2015, the Asia-Pacific and Latin American regions had two of the highest growth rates globally, according to the International Air Transport Association, with traffic growing by nine and eight percent, respectively. Additionally, passenger demand between Asia and the Latin American/Caribbean region has risen 55 percent in the last five years, up to 1,834,300 passengers in 2014. MIA continues to provide more flights to Latin America and the Caribbean than any other U.S. airport. Miami International Airport offers more flights to Latin America and the Caribbean than any other U.S. airport, is America’s second-busiest airport for international passengers, boasts a lineup of 100 air carriers and is the top U.S. airport for international freight. MIA, along with its general aviation airports, is also the leading economic engine for Miami-Dade County and the state of Florida, generating business revenue of $33.7 billion annually and welcoming 70 percent of all international visitors to Florida. MIA’s vision is to grow from a recognized hemispheric hub to a global airport of choice that offers customers a world-class experience and an expanded route network with direct passenger and cargo access to all world regions. MIA is committed to sustainable practices. Learn more at www.MIAefficiency.com.